That woman was Seana Hogan, multiple Race Across America winner and multiple ultra-cycling record holder; an absolute cycling legend and a smart cookie too. She gave me that advice last year after I had to pull out of the World 24-hour TT championships after 19 hours as I struggled with severe heat exhaustion. She went on to win the race and set a new course record. I don’t like giving up, but also know when to listen to my body. Stopping was the right thing to do at last year’s 24-hour world championship race (and so was stopping this year’s LEJOG record attempt … but that is for another blog post…). Unfinished business motivates me. So, this year, I came back to finish what I started. I knew I was able to not just finish the 24-hour race, but also ride a pretty good race, if only I was better prepared and adjusted my pacing according to the conditions. Last year, I had entered this event because a DVT had thwarted my main goal of the UK National 24-hour time trial championships in July. This year, I arrived with the UK National 24-hour TT title already in my pocket. That win had given me confidence, as had wins at Zandvoort 24 hour in June and Revolve 24 hour in early September. But none of these races had been in the desert with its dry air and huge temperature swings. And none of these races were demons like this one. With Seana’s words at the back of my mind, and my coach’s advice at the front of my mind, I went into this year’s championship with quite a different mindset. I was calm, relaxed and determined. Focused on me, nothing else. If I could handle the conditions, everything else would flow from there. Riding and pacing optimally for the course and the conditions was the number one goal. I had done my training; I knew my biomarkers were all within a good range, and I had done my preparation for the heat. The sessions in the heat chamber at Kingston University were particularly enlightening; thank you Chris Howe. The conditions were set to the worst I would expect to face in Borrego Springs. The heat was set at 30 degrees for the first 45 minutes, rising to 35 degrees for the last 15 minutes. Humidity was set at 35%. The sessions clearly demonstrated what power level I should not even contemplate exceeding for an hour in the heat, let alone for 24 hours. At the higher level my core body temperature exceeded 39.4 degrees by the end of the hour. I still felt fine, but a heart rate of 94% of max at a power level I should normally be able to hold for up to 12 hours, showed me that I was far from fine. The sessions also showed me the importance of drinking plenty of fluids. Despite drinking 1.2 litres during the hour I spent in the heat chamber, I each time lost 1 kilo in body weight (so actually 2 kilos). I had also done turbo sessions without fan and with the windows closed as well as a couple of Bikram yoga sessions. Doing yoga in a room heated to 40 degrees and with a humidity of 40% was beneficial for this race, but I also really enjoyed it. It gives great energy, makes your skin glow and helps with flexibility. Stretching the hips, back and hamstrings is particularly useful for someone like me who spends so much time, either sitting behind my desk or sitting on my bike. The heat quickly becomes bearable. The poses always remain challenging. Importantly, it taught me that it isn’t about the absolute shape of the poses, it is about the intention with which you practice. Keeping things honest and unforced, listening to your body, resisting the urge to compare yourself to others, focusing only on yourself, being kind to yourself. And all of that applies just as much to yoga as it does to cycling or life itself. Of course, it was sod’s law that the weather conditions were much more benign this year than they had been last year. Temperatures ‘only’ plummeted as low as 5 degrees at night and didn’t exceed the low 30s during the day. We were also blessed with a beautiful full moon and light winds, apart from the last few hours when the wind picked up significantly and even made me consider if I wouldn’t be better of walking at one point. Last year my husband Chris had been there to support me during the race. This year it was just me (as Chris had to travel for business), but luckily my friend Cat Archer had agreed to ‘share’ her husband with me as pit crew. James did a fantastic job. Crew members are not allowed on the course for this race. They can only support riders from the pit area, which is quite small and crowded. We therefore decided not to do hand-ups, but just stop and do a full swap of all 3 bottles on the bike after every 3 to 4 laps, depending on the conditions and how quickly I would get through them. For the first few hours James was ably assisted by Craig Archer, who had ridden with me during my Zwift distance record attempt in February. I didn’t know him other than from the virtual world of Zwift, so it was a great surprise to suddenly find him introduce himself while I just woke up from a little pre-race snooze in the grass at Christmas Circle common, the start and heart of the race course. The world is such a small place and Zwift is such a cool way to bring riders together. For this race write-up I will try to focus on what went through my head. After all, the mental side of racing is what can really make the difference in these long races. 17:00 Race start: Standing at the front of my start wave, I felt so much better prepared than last year. Knowledge is power. Knowing what I am getting myself into makes me feel calm and excited at the same time. I am looking forward to doing my trip here justice, to ride optimally and to learn from last year’s experience. 3,2,1 GO…. It took some will-power, but I succeed in resisting the urge to jump on the back of the wheels of the fast guys for the first 10 draft-legal miles. It made me smile. In my mind, I congratulated myself: “Well done Jas; that is one tick in the box of riding your own race”. My old me would, like last year, have been tempted to consider it as ‘free speed’ for the 10 miles and as a good opportunity to be ‘up’ on my competitors. But all that is nothing but vanity. What may be a relatively easy start for the guys is still way overdoing it for me and that excessive jump in power will only come back to bite me later. 10-mile point: Surely but slowly I started to overtake riders who had been tempted to jump with the fast guys. All it took to establish a lead on the women’s race (in my start wave that is), was keeping my power up on the long descent on the back of the course, and then riding steady. First few hours: “Keep your head Muller, steady does it” is what I keep telling myself. Glancing at the power meter, I am aware that, although I am riding more reigned in than usual, I am still overdoing it somewhat. I guess it takes more than 1 race to change my colours, but slowly I will get there. When the sun sets, the colours in the sky are simply amazing and I enthusiastically point up at the sky to another racer, hoping he feels just as excited by it all as I am. I realise how fortunate I am to race here in the warmth and in this beautiful desert setting, while back at home in the UK the first night frost has arrived. 20:30 I make my first stop for a full bottle swap, eat a banana on the spot and James gives me 2 snacks for on the road, which I push under the elastic on my aerobars. I am still warm, but with last year’s experience in mind, I decide to pre-empt the conditions and opt to already put on arm warmers and a down gilet for the night. From 23 degrees Celsius at the start of the race at 5 pm, it has now gone down to 15 degrees. 00:15 I am still in good spirits. I love night riding and this night ride is even more special under the light of the full moon. At the section of the 18-mile big loop that passes the orchards there is a lovely smell of fruit (I think) that adds to my sense of orientation. Strangely, the smell is only there during the night. It is time for a 2nd stop to swap out all my bottles, eat a brioche, pick up 2 more snacks and add some more layers as the temperature has now gone down to 12 degrees. I add an extra jersey under my down gilet and also put on some toe warmers. 04:20 The dark makes it somewhat easier to only focus on your own race. All you see in the distance is the red glow of other riders’ rear lights. You don’t know who they are, and it doesn’t matter either. All there is to worry about is you, your comfort on the bike and your pace. It is serene, peaceful and things just flow. The night can play welcome tricks on your mind: gradients seem less steep in the dark and potholes less severe. Some cyclist were lucky to see coyotes and owls. Not me; all I saw was the numbers on my bike computer. I am easily tricked into chasing a certain average speed (which I know will get me the distance or time that I want). But for this race, I have taken all speed readings off my screen. All it shows is power, distance and time, both overall and for the lap that I am on. Heart rate, cadence and temperature are there as supplementary information. It seems to work well. After a fast opening lap of a long 49, my lap times are stabilising between 55 to 58 minutes. Although I am stopping more often and longer than others (as I am such a sweaty/thirsty rider), I appear to be in the lead. I don’t know by how much, and right now that doesn’t matter. There is still a long way to go. What does matter is managing my temperature. At this stop, James gives me a warm miso soup, which is not only nice and warm but also give me a bit more salt that I am craving. 07:00 The early morning hours were some of the hardest hours. The temperature reached their lowest point, of just 5 degrees, around sunrise at 6:30am. With all my focus on the heat in preparation I now realise I should have had more layers with me for the night. I did bring a pair of winter gloves, which I am contemplating stopping for. Oddly, my hands are not that cold. It is my legs that are cold. My calves are nice, warm and happy in the Isobar compression calf guards. But my upper legs are quite cold. If only I had remembered to bring some knee warmers! I make a very brief stop around 7am just to turn on one of my other rear lights (long live redundancy). Seeing the moon disappearing on one side of the valley and the sun rising on the other helps to lift my spirits again. 08:00 Time to remove my big Exposure Toro front light (I love it!) and take off some of my night layers. With the 12-hour racers now joined, the pit area was getting increasingly crowded and lively. The temperature came back up to 16 degrees and my legs slowly regained some feeling. So far, I paced it relatively well and my average/normalised power wasn’t too far off target. Apart from too few layers at night, I raced sensibly and felt happy with my performance. I am not sure if it was at this point in the race when James asked me if I want to know how well I am doing. I told him: “no, not yet. All I need to know for now is that I am doing well. There is still a long time to go”. When it gets nearer to the end of the race, I will want to know how much lead time I have or how much time I need to make up, but right now, there is little point in distracting myself with such information. “Race your own race”. “Pace yourself”. Those are the only phrases I repeatedly tell myself. 11:05 Another beautiful day in paradise had started and the temperatures quickly started to rise. By 10am it was 24 degrees and, despite drinking lots (thanks Chris for the race nutrition plan), I finally find myself needing my first (and only) pee stop. I won’t go as far as some racers and pee on the bike, but having perfected my stand-up peeing technique in the bath tub, I managed a reasonably quick pee stop without having to remove any clothes. Feeling pleased with myself, and relieved, I got back on the bike again, but only for one more lap as rising temperatures called for ice. Last year I waited too long with ice; this year I didn’t want to make the same mistake. So, I stopped and James and Helen Hall (who was there to assist Andy Jackson to a win in the 12-hour race) stuffed an ice sock (piece of stocking filled with ice cubes) in the back of my skinsuit and doused my sleeves and shoes with water. I took a slice of the water melon James cut up and set off again. 12:15 By now, the temperature had gone up to 35 degrees and I purposely slowed myself down. I tried not to get upset with a drop in power or speed and just take it as it comes, telling myself that I will be able to pick it up again later on when things start to cool down. Whatever happens, I really didn’t want to bugger this race up by riding like a fool and pushing through when my body won’t allow for it. On hindsight, I think I should perhaps have used a little caffeine at this point to help raise my heart rate (which would in turn have helped to bring my power up). The caffeine chewing gum has worked well during the night. It had refreshed my mouth, provided me with a little boost (without any stomach upset or jitters) and had been quickly absorbed through my gums. 13:18 My lap times had started to go up to over 1 hour, but based on the feedback I received from James it seemed everyone else had also slowed down. Mentally I still felt in a very good place, but the chafing around my crotch was getting increasingly uncomfortable. I love that NoPinz skinsuit I was riding in (and the white top and sleeves are great for riding in the desert), but I really think I should get a Le Col chamois inserted in it (or find a Le Col skinsuit in XS). I tried to block out the pain, mix up my riding style a little (in and out of the saddle and changing between aerobars and base bars), and focus on the race instead. It is in these final hours that support from fellow racers can really make a difference. Hoppo, Marko, Jason, Andy, Sparkles … all of your shouts were much appreciated. 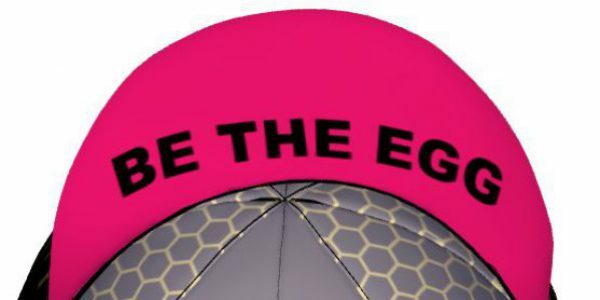 I may have been a fried egg by now, but your “Be the egg!” shout really helped Jason. And oh… how jealous I was once again of that comfortable recumbent seat of yours. 14:30 This was my last pit stop. One more ice sock, one more soaking in water, a few more snacks. Officially the finishing loop of c. 4.8 miles would open at 15:30, so I had little choice but doing one more big loop. During the last lap the wind had already been increasingly annoying. Especially at the top of the course, it felt like I was going backwards against the wind, despite near exhausting myself. This final loop was soul-destroying. I lost 15 to 20 minutes on it. There were times where I thought I would be better off walking, but the few riders I saw getting off, all remounted again. The larger and fresher riders seemed to not even be affected by the wind, effortlessly pushing their way through it, leaving me in their wake, jealously gazing at their ever-smaller silhouettes. The fast descend is a whole lot slower and more scary in the strong cross wind and I constantly tell myself (out loud) that “speed is my friend” as I click into a larger gear to power my way down one last time. I blamed myself for gambling on another big loop, wishing I had just waited for the smaller loop to open. When I learn later, that the race organisers opened the smaller loop at least 15 minutes ahead of time, I feel even more sad about my decision. But in a long time trial like this it hardly ever comes down to that level of strategy. Some people were just lucky to hit the small loop at the right time. Others had to curse the wind for one more lap. 15:55 I calculated that, as long as I could bring my power back up, I should be able to bash out at least 4 laps of the finishing circuit. Race rules are such that laps only count if you cross the line before your 24-hour period is up. In other words, riders like me who started in the first start wave at 17:00 need to have crossed the line by 17:00. Any distance covered after 17:00 doesn’t count. When I pass the pit area (no more time for stops now), James shouts that the other riders are catching me and that my comfortable lead is diminishing somewhat. I put on the after burners. I am slow compared to some others, but a lot faster than I have been for the last few hot hours. The temperature has come down to a ‘comfortable’ 25 degrees again and I find out how badly I want to win this race. I really want to get that last full lap in and proof to myself that I can adjust my pacing to the conditions. 16:57:22 I crossed the line, with a big happy smile. I did it. We did it. Me, James, my coach, my LEJOG crew, and all those who have shown themselves to be true friends over the last year. Last year’s demons are conquered; negative voices have been silenced and forgotten. I AM A WORLD CHAMPION. I am no longer a headless chicken. I may be able to become the racer I want to be. I feel like I am at the beginning of a very exciting journey indeed. Thank you Seana for your wise words, for being such an inspiration and for being as supportive as you are competitive. I already look forward to racing you once again. I also found out that Cat achieved a massive PB. Well done, and thank you Cat for sharing ups and downs this year and for sharing this special race with me. I know there is more to be gained in this race. 433 miles is certainly not the greatest distance I have ever covered in 24 hours, but for this race it was enough and, based on the conditions and the course, I am very happy with it. My pacing could still improve. Doing hand-ups would gain at least 20 minutes. Ditching the 23 mm tyres and opting for 25 mm instead would give more comfort. A better chamois would help too. A mouth shield at night would help with the dry desert air. There are so many little things that one could always improve on. For the time being, I am just chuffed (and luckily no longer chafed) to bits with this year’s result. Stay posted for LEJOG reflections … (I still need a little more time) … and updates about what 2018 may have in store for me. Previous Post LEL – Sign me up for 2021! Great read . Congrats on another amazing performance. Keep inspiring others . Amazing ride and well written story! Preparation, Pacing and Attitude are so much of a race like this and you nailed all of it, Jas!